Does Auto Registration Impact Flash Archives? How Does Auto Registration Impact Flash Archives? The Flash Archive installation feature enables you to use a single reference installation of the Oracle Solaris OS on a system, which is called the master system. 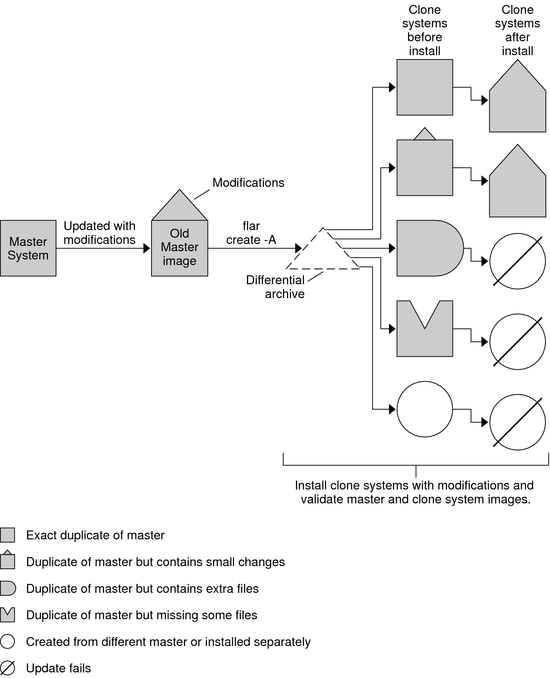 Then, you can replicate that installation on a number of systems, which are called clone systems. You can replicate clone systems with a Flash Archive initial installation that overwrites all files on the system or with a Flash Archive update that only includes the differences between two system images. A differential update changes only the files that are specified and is restricted to systems that contain software consistent with the old master image. You can use the Live Upgrade, a feature of Oracle Solaris, luupgrade command to install a ZFS root Flash archive to a ZFS rooted alternate boot environment. You can use the interactive text-mode installation method to install a system with a ZFS Flash archive. You can use the -D option of the Live Upgrade lucreate command to create a separate dataset for /var when you migrate a UFS root file system to a ZFS root file system. For detailed instructions and limitations, see Chapter 5, Installing and Booting an Oracle Solaris ZFS Root File System, in Oracle Solaris ZFS Administration Guide. Unlike the ZFS Flash Archive in the previous releases, a Flash archive created on a ZFS root master system does not contain all the existing boot environments. Instead, the archive only contains the active ZFS boot environment. The archive does not include those datasets that are excluded explicitly with the -D option of the lucreate command and the user data present in the top-level pool dataset. The swap and dump volumes are not included into the archive but are created when the Flash archive is installed. For more information on ZFS Flash Archive creation and installation , refer to Chapter 5, Installing and Booting an Oracle Solaris ZFS Root File System, in Oracle Solaris ZFS Administration Guide. Auto Registration, a feature of Oracle Solaris, is new in the Oracle Solaris 10 9/10 release. When you install or upgrade your system, configuration data about your system is, on rebooting, automatically communicated through the existing service tag technology to the Oracle Product Registration System. This service tag data about your system is used, for example, to help Oracle enhance customer support and services. You can learn about service tags at http://www.oracle.com/technetwork/server-storage/solaris/oracle-service-tag-faq-418684.html. You can use this same configuration data to create and manage your own inventory of your systems. By registering with your support credentials using one of the registration options below, you have a straightforward way to inventory your systems, by recording and tracking the service tags for the systems and for the software products installed on the systems. For instructions about tracking your registered products, see https://support.oracle.com/CSP/ui/flash.html. You may elect to have your configuration data sent to the Oracle Product Registration System anonymously. An anonymous registration means that the configuration data sent to Oracle has no link to the name of a customer. You, also, have the option to disable Auto Registration. For an overview of Auto Registration, see Auto Registration in Oracle Solaris 10 8/11 Installation Guide: Planning for Installation and Upgrade. If you create a Solaris Flash archive based on a master system that was installed with a release prior to the Oracle Solaris 10 9/10 release, that archive does not include Auto Registration. Auto Registration has no impact on your work with that archive. If you create a Flash Archive based on a master system that was installed with the Oracle Solaris 10 9/10 release or a later release, that archive does include Auto Registration unless it was specifically disabled on the master system. For details, see the next section. For any archive based on the Oracle Solaris 10 9/10 release or a later release, Auto Registration is enabled by default unless it was specifically disabled on the master system. When you install the Solaris Flash archive or upgrade a clone system with the differential Flash archive, configuration data about that installed or upgraded system is, on rebooting, automatically communicated through the existing service tag technology to the Oracle Product Registration System. Auto Registration uses support credentials and proxy information that you provide before or during an installation or upgrade. The means of providing that credential and proxy information depends on which installation method is used, as shown in the following table. During the installation of a Solaris Flash archive, you are prompted in the installer screens to provide your support credentials and, if needed, proxy information. After the installation, the system is registered on reboot. If you do not provide support credentials, an anonymous registration occurs on reboot. You can provide your support credentials and proxy information by using the auto_reg keyword in the sysidcfg file prior to the installation of an archive or prior to an upgrade with a differential Flash archive. If you do not use this keyword, you are prompted to provide this information during the installation of the archive or during the upgrade. After the installation or upgrade, the system is registered on reboot. If you do not provide that information, an anonymous registration occurs on reboot. The Solaris Flash archive uses the same Auto Registration settings, including support credentials and proxy information, that were specified on the master system. As long as Auto Registration was not disabled on the master system, the archive system is, after the upgrade, automatically registered on reboot. You can provide your support credentials and proxy information by using the auto_reg keyword in the sysidcfg file prior to the network installation of a Solaris Flash archive. If you do not use this keyword, you are prompted during the network installation to provide this information. The archive is registered when the system reboots after the installation. If you do not provide that information, an anonymous registration occurs on reboot. For further information, including instructions about how to disable Auto Registration, see Auto Registration in Oracle Solaris 10 8/11 Installation Guide: Planning for Installation and Upgrade. Starting with the Oracle Solaris 10 9/10 release, this document now includes instructions about how to create a Flash Archive recovery image that can be used to restore a system to “factory fresh” condition. See Chapter 5, Creating and Using a Disaster Recovery Image. This chapter provides the simplest instructions to create a Flash Archive image that can be loaded onto the target system to recover from a failed disk drive. Starting with the Solaris 10 10/09 release, you can set up a JumpStart profile to identify a Flash archive of a ZFS root pool. A Flash archive can be created on a system that is running a UFS root file system or a ZFS root file system. A Flash archive of a ZFS root pool contains the entire pool hierarchy, except for the swap and dump volumes, and any excluded datasets. The swap and dump volumes are created when the Flash archive is installed. Generate a Flash archive that can be used to install and boot a system with a ZFS root file system. Perform a JumpStart installation of a system by using a ZFS Flash archive. Note - Creating a ZFS Flash archive backs up an entire root pool, not individual boot environments. Individual datasets within the pool can be excluded by using the flarcreate and flar command's -D option. For detailed instructions and limitations, see Installing a ZFS Root File System (Oracle Solaris Flash Archive Installation) in Oracle Solaris ZFS Administration Guide. You can install a master system with a Flash Archive archive for an initial installation by using any installation method: Oracle Solaris installation program, custom JumpStart, Live Upgrade, or WAN boot. All files are overwritten. The Flash Archive installation is a five-part process. Install the master system. You select a system and use any of the Oracle Solaris installation methods to install the Oracle Solaris OS and any other software. (Optional) Prepare customization scripts to reconfigure or customize the clone system before or after installation. Create the Flash Archive archive. The Flash Archive archive contains a copy of all of the files on the master system, unless you excluded some nonessential files. Install the Flash Archive archive on clone systems. The master system and the clone system must have the same kernel architecture. For further information, see Installing a Sun4U Flash Archive on a Sun4V Machine. Scripts can be used for customization. You can install extra packages with a Flash Archive archive by using the custom JumpStart installation method. The packages must be from outside the software group being installed or a third-party package. (Optional) Save a copy of the master image. If you plan to create a differential archive, the master image must be available and identical to the image installed on the clone systems. For step-by-step instructions, see Installing the Master System. 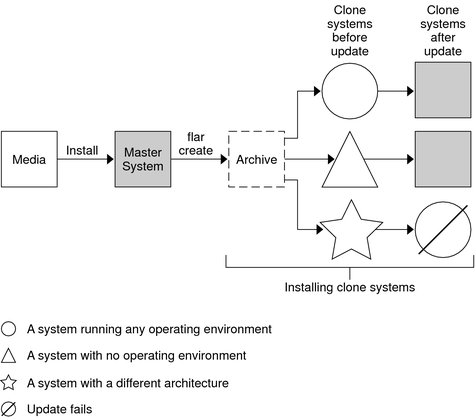 Figure 1-1 shows an installation of clone systems with an initial installation. All files are overwritten. If you have a clone system and want to update that system, you can create a differential archive that contains only the differences between two images, the unchanged master image and an updated master image. When you update a clone system with a differential archive, only the files that are in the differential archive are changed. You can choose to install a Flash Archive differential archive with the custom JumpStart installation method or Live Upgrade. An update is a five-part process. Prepare the master system with changes. Before changes are made, the master system should be running a duplicate of the original archive. Note - If the master system is not running a duplicate of the original archive, the differences between the two system images might result in a large differential archive. Consequently, installing the differential archive could be time consuming. Use an initial installation with a full archive in this case. Mount the directory of a copy of the saved-unchanged master image. This second image is to be used to compare the two system images. Access the image by the following methods. Create the differential archive with the -A option of the flarcreate command. Install the differential archive on clone systems with custom JumpStart. Or, you can use Live Upgrade to install the differential archive on an inactive boot environment. Figure 1-2 shows the creation and installation of a differential archive. A master image is updated with some modifications. These modifications could be as simple as the addition, reconfiguration, or deletion of a few files, or as complex as propagating patches. The updated master image is compared to the unchanged master image. The differences between the two images become the differential archive. The archive can be used to update other clone systems that are currently using the unchanged master image. If the clone system has already been modified or is not running the unchanged master image, the update fails. If you have many changes to make on the clone systems, you can do an initial installation at any time.